Once in the Airport take the Subway Line Number 8 until “Colombia Metro Station”. 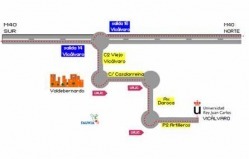 Then change into the Subway Line Number 9 until “Vicálvaro Metro Station”, where the Rey Juan Carlos University is located. Vicalvaro underground station is adjacent to the campus. Bus from/to Airport: Colón Sq. from 4.45 a.m. to 1.30 a.m. each 15 min. Price: EUR 2,5. If you arrive in Madrid by plane, you could take the underground, line 8 (pink) direction to Mar de Cristal (2 stops). Then you must change to line 4 (brown) direction to Avda. América (7stops), and there get off and take line 9 (purple) direction to Vicálvaro (10 stops). "Mapa del Metro de Madrid"